When the budget won’t stretch to a BMS . . .
– There is no doubt that installing a full BMS (building management system) is seen as the ‘principal route’ to substantial energy savings. However in many cases the budget is just not available or there may be significant resistance to the disruption of installing a BMS into an occupied building. The consequence . . . many companies reject or defer introducing any type of controls, and miss out on vital energy savings. There are low cost, and ‘simple to implement’ stand alone commercial lighting control solutions available that overcome these barriers. One very effective option being the CP Electronics ranges of lamp or batten mount sensors that turn any LED, T5 or T8 into an energy saving luminaire. The EBMPIR-MB products offer a flexible and cost-effective solution for batten mount luminaires at standard mounting heights up to 7m. These luminaire mounted PIR detectors are very easy to install allowing energy savings instantly through the automatic control of lighting throughout the building. 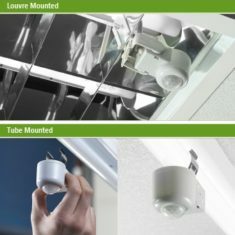 Specifically designed for mounting onto a batten style luminaire allowing retrofit upgrades to existing lighting systems. The units are IP65 rated and are therefore suitable for outdoor use as well as wet and wash-down areas. View video to see how this product was used at a station carpark to save energy on lighting. The EBDHS-MB is a range of luminaire mounted high bay PIR presence detectors, sensing movement up to 40m at a 15m mounting height, with a maximum mounting height of 20M. This makes them ideal for commercial lighting control in areas with demanding spaces and increased mounting heights such as warehouses and factories. 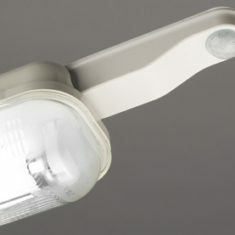 The sensor is simple to retrofit to commercial luminaires and basic battens. Available in three options: switching (PRM), Direct Dim (DD) and analogue dim (AD), all of which will switch incandescent, fluorescent, compact fluorescent and LED light sources. The direct dim model will control DALI or DSI digital dimming ballasts and the analogue dim is designed for variant control 1-10V dimming ballasts. 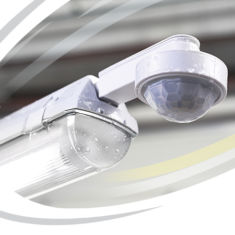 IP65 rated as standard this sensor is also ideal for outdoor use as well as wet and wash-down areas. A selection of fixing washers are supplied as standard to aid fitting to a variety of luminaires. Another retrofit solution is the EBMINT, a new range of integrated presence detectors which can be fitted onto the LED, T5 or T8 tube directly, or to a louvre blade of a parabolic louvred luminaire which makes them ideal for installations which demand minimum disruption or where it isn’t possible to disturb the fabric of a building (such as where asbestos is present). These examples are a few of many options demonstrating that you don’t need a massive budget to achieve energy savings. The key to energy efficiency is to keep to your budget, but make your building work harder and smarter! As companies choose to refurbish rather than move offices, this type of solution will become more and more popular – it can play an important part towards improving a building’s energy performance, with minimal investment and disruption. So if installation of a BMS is out of reach – it is NOT the only solution! A small budget should not prevent you from achieving energy savings, you just need to consider a different approach. Visit the C P Electronics section of Our Shop for the full range of sensors (new products added on a regular basis), specifications, and installation guides.